Heike Philp took us through the highlights of various online conferences she has organized, been a part of, and most importantly, recorded. Noting that the Virtual Round Table WebCon, the DaFWEBKON for teachers of German, and the SLanguages Annual Symposium attracted some 4,500 synchronous participants in total, but that the recordings have been watched over 23,000 times, Heike supports the proposition that these recordings may serve as the ‘Khanacademy for language teachers’. Here are the mp3 recording and YouTube link from this Hangout with Claire Siskin, Chris Fry, and Jeff Lebow. Topics ranged from the full story of griefer-spammer James O’Reilly through to what we learned from MultiMOOC. And there’s more about that in the last just updated blog post at http://evomlit.wordpress.com/2013/02/22/applying-what-we-learned-in-multimooc-in-evo/ revising Writingmatrix so that it can once again share student writing worldwide. You could use this technique to follow student blogs or blogs from any group or individual you wish to follow. I had offered to help participants set up their Google Readers hands-on to find all the posts in blogs that have been written to reflect on certain EVO sessions. But the participant mix took the conversation into other directions. We encountered a problem through choice of Sync.in. After 8 participants had joined the chat it would allow no more (and we were relying on that chat to disseminate the Hangout link on the fly). We didn’t realize until 15 min. 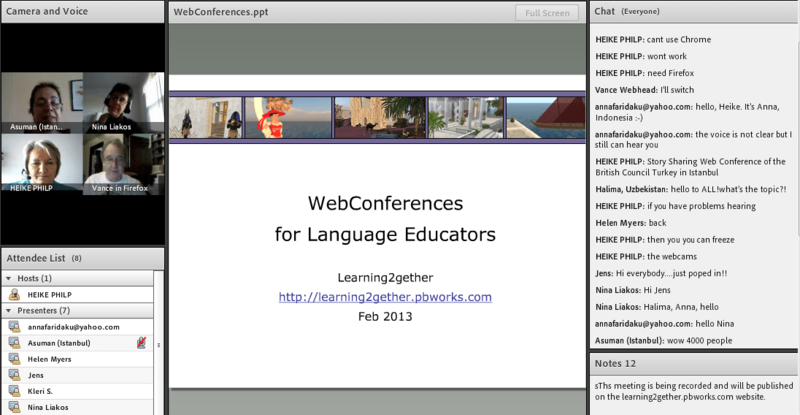 into the program that people could hear the stream but couldn’t communicate with us or figure out how to join the hangout, but eventually stragglers made it in and informed us, so tweeted the Hangout link and put it up at http://learning2gether.pbworks.com and created the second TitanPad text chat below. This procedure overcomes two limitations of hangouts. One limitation is that you can only have 10 in a Hangout at a time. The other is that it’s hard to tell people where you’ll be hanging out because hangouts are designed to be found through your circles and other social features of Google + so there is no URL to give out until the Hangout actually starts. Thus, many Hangouts are announced, but participants can’t enter because there are ten there already, and the participants are left standing outside a locked door, which is not colleaguial. http://webheadsinaction.org/live overcomes both these problems. First, I can embed an Etherpad clone chat there where anyone can interact. I can put the hangout URL there and others can click on it and join the chat, or if you are having problems you can get help in the chat (in practice we ran up against the 8 participant limit in Sync.in, which we will avoid for this purpose in future). Secondly, since the YouTube embed that lets you play the recording later HAPPENS to stream the event while it’s in session, then anyone can visit the URL where that link is embedded and listen to the stream. So if the Hangout is full, hundreds more can listen in and interact in the Titanpad chat (thousands? tens? no idea actually). We can also announce on the stream when places become available in the Hangout and participants in the Hangout can be rotated in and out that way. So one purpose of the session will be to Learn2gether about Google Reader how to follow class sets of blogs. But in so doing we’ll see how to stream a Hangout so it can reach beyond just the ten in the hangout itself. I tested this at around 1300 GMT with Kalyan Chattopadhyay. Holly Dilatush graciously agreed to share her comments here which she posted to Google + as we were meeting together. It seems she was having F.U.N. I just heard Jeff’s Sae-hey-bok-mahn-ee-pah-deu-sey-yo! (or something close!) i will never forget that expression = Happy New Year in Korean! Happy New Year, all! I use the exercise balls, too… great idea for non-squeak! [I’m typing more notes as I listen!] Fun, fun, f.u.n.! So much fun to see you all! I haven’t signed up for kubbu = too many things to keep track of and testing my ability to say “No.” (or at least, “Not now”). Every new post about it tempts me to go sign up and play, too. But as of today I have not signed up. psychedelic flashes! (Why?) Are there really colors flashing in her room? (not sure who that is). Oh… listening to Rita talking about Webheads… yes, yes, yes! Vance was punished?! No, no, no… come back, Vance! How quickly we feel frustrated! So many options! Isn’t it amazing that we are navigating all of these (or at least some of these) = I used to give up but now keep trying most of the time = often without thinking twice. Podcasting = I do need to revisit this… was frustrated with this in the past. Isn’t it interesting what we choose to follow, why, and when/why we give up? Anyone know Blog Talk Radio ? Nina lost in Google Hangout Toolbox? Vance’s voice gone again! and back again! Trace Effects game = another I’ve passed on for now… How do we keep up with all the things we attempt to keep up on. OK… sorry guys, have to stop listening… but these hangouts on Air recordings make me feel less left out (won’t make TESOL this year; didn’t make TESOL last year, and miss seeing everyone in person; this is the next best thing!). Abstract: Open education was often laughed at or ignored until the emergence of Massive Open Online Courses (MOOCs) with their tens–or even hundreds–of thousands of learners in a single course. Given the mass success of Stanford courses topping 100,000 each and startups like Udacity and Coursera as well as the announcement of edX (from Harvard and MIT), we can no longer look the other way. Still, many questions about MOOCs and other forms of open education remain, such as those related to infrastructure, marketing, pedagogy, and assessment, to name a few. 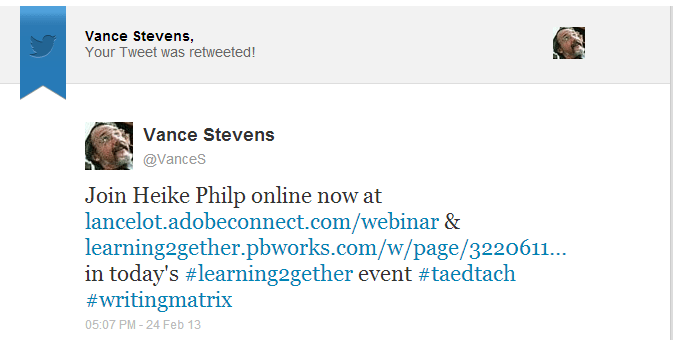 Just how does an instructor or trainer keep thousands of students motivated and involved in such a course? And what are the more promising business models? In this talk, Bonk will detail his experiences in teaching a MOOC and offer guidelines for others hoping to create a highly engaging MOOC-based learning environment. A set of 10 key leadership steps and another set of 10 pedagogical principles will be outlined with examples. He will also map out a set of business plans and more than a dozen types of MOOCs. In the end, MOOCs and mass movement to open education will no longer be such mystery. 1. Much experimentation with MOOCs and open education today; dozens of possible business models (advertisements, fees for completion certificates, pay as you go, company sponsored courses, assessment fees, etc.). 2. Will the certificates that students earn while taking MOOCs make traditional college degrees obsolete? 3. What steps might a company, government agency, or university take to be a leader in this movement toward MOOCs and open education? Curt always goes all out in his presentations for our learning communities. When he presented at one of our WiAOC events, he presented not once but twice! In a flipped presentation approach, Curt took questions in the first hour and elicited our discussion of MOOCs and other areas of educational technology we should be focused on. At the top of the hour he started talking (quickly) about his 85 slides. That part of the presentation provides an interesting and comprehensive chronicle of recent developments in the MOOC phenomenon almost day by day. Unfortunately we had to rush him offstage after almost two hours benefiting from his candor and expertise, to make way for another session that had reserved the Elluminate room. Our apologies for overflowing onto that group, which responded competently by regrouping in Adobe Connect. The Chronicle of Higher Ed asked four professors teaching free online courses to describe their experiences. 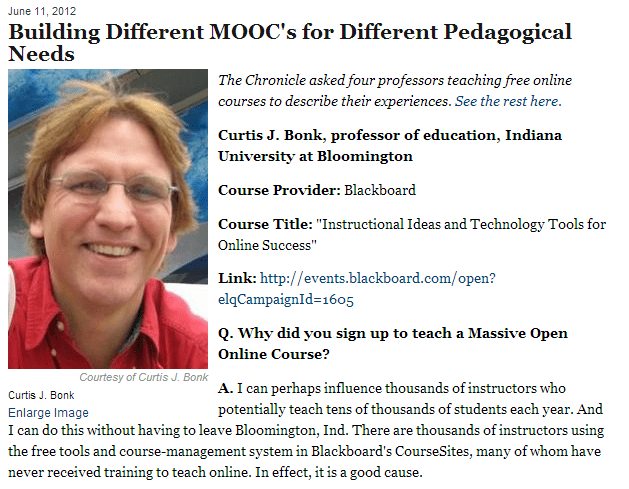 MOOC is a model for knowledge-development that has been getting a lot of attention lately. By the time of this presentation, this year’s EVO (Electronic Village Online) sessions will be in their 4th week. One of these sessions, MultiMOOC (Multiliteracies MOOC), is exploring the concept of MOOCs through emulation of a cMOOC, a connectivist one. The session explores the MOOC movement since 2008, assesses its significance in supporting education, and plots its course as MOOCs diverge in purpose while gaining in popularity this far into 2013. 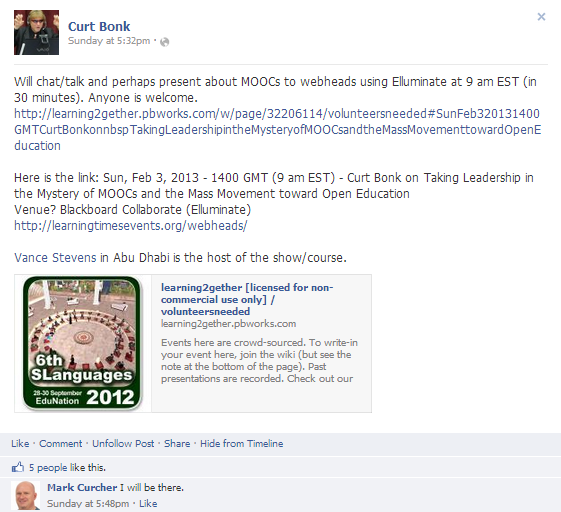 It has been said that a cMOOC has a syllabus that participants are expected to break. A cMOOC sets the stage for learning, but the plot unfolds as the participants appear and carry out that learning through their own initiative stimulated through networking with one another (in fact, one of the most useful take-aways of participation in a MOOC is expansion of one’s PLN). In this presentation, participants in the MultiMOOC session and their moderators will gather at a time normally set aside on Sundays for another elearning initiative, Learning2gether. We will discuss our experiences in the EVO sessions so far in conjunction with the Learning2gether movement, as well as our connection with other online learning networks such as Connecting Online and Webheads, which the lead presenter helped to found. We will try to draw some conclusions from our perspectives on how the MOOC model is working for developing knowledge within our network in the context of elearning via the EVO sessions.